Clean animals are distinguished by two characteristics; a cloven hoof (a hoof split into two parts) AND multiple stomachs (it must chew its own cud). Do we really believe that Yehovah does not change and that His words will endure forever? Forever! That is the beginning of time until the end. Noah was taught Yehovah’s set apart ways, which never change, by Methuselah who knew both Adam and Seth for 200+ and 300+ years and was raised by his father Enoch. It was Noah who walked with Yehovah; and because he did, all his family was saved from the flood that destroyed the antediluvian (pre-flood) world. Because Noah understood Yehovah’s ways, he also could distinguish between unclean and clean animals. So when Yehovah told Noah to put 7 pairs from all clean animals and 2 pairs from all unclean animal on the ark, Yehovah did not have to explain any further; Noah knew exactly what He meant. It is the intent of these articles about “Clean and Unclean Foods” to assist others to accurately discriminate between what is acceptable in promoting Yehovah and His ways on the earth and what is not, with respect to food. 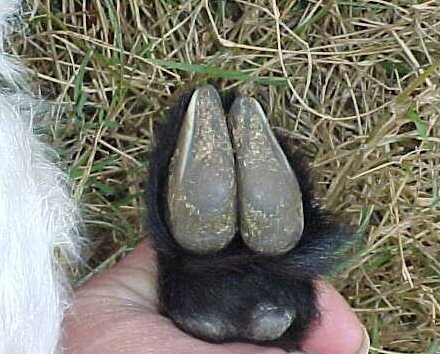 The first characteristic that clean animals must have if they are meant for food is a cloven hoof, or put another way, a hoof split into to parts. 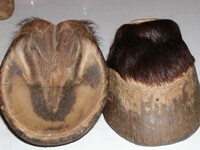 A cloven hooved animal has two complete divided parts as does the hoof of a goat pictured on the left and the hoof of a swine (pig) on the right. Note: Finding a picture of live swine hoof, that I could see through the filth these animals live in, was not easy. As they say on Sesame Street, one of these animals is not like the others. For only one of these is considered food by the Creator. 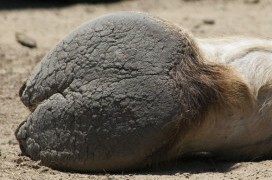 The horse and the camel can be ruled out because they do not have split hooves. But to differentiate between the second two we must understand how their body process what is eaten. The final characteristic which these clean animals must have to be considered as food for Yehovah’s people is, they must chew their cud. Animals that chew their cud are called ruminant animals; they chew the cud regurgitated from their rumen, or their stomach, sometimes called their first stomach. This diagram shows a ruminant’s digestive track. The ruminant, let’s say a goat, eats the forage. The forage passes through its esophagus to the rumen, which scientists see as a large fermentation vat, also called the “paunch.” There is not much oxygen in there, but there are a lot of gases. The gases in the rumen cause the bolus or the chewed food to regurgitate, or pass back up the esophagus into the mouth. The ruminant then rechews that bolus, invigorating it with more saliva, and passes it back to the rumen, where the process continues. The rumen hosts many microorganisms which eventually digest the food, making fatty acids, protein and vitamins. Eventually everything passes into the abomasum which is the true stomach and passes into the large intestine for water absorption and the small intestine for the final digestion of proteins, carbohydrates, and fats. Ruminant animals are designed by the Creator to eat live food, they do not eat meat and especially anything that has died. In contrast, swine will eat practically anything, alive or dead; a pig will eat its own young, its own feces and a pig will eat you. A rabbit and a hare have a completely vegetarian diet and both chew their cud, but they do not have hooves, divided or otherwise. They have paws, and everything that has paws is considered unfit by our Creator for human consumption. Now that we have a better understanding of what things a tahor (clean) in the sight of Yehovah; we must now understand how these foods relate to Leviticus 17 and meat “sacrificed” to “idols.” Oh my, we have learned so many false ways in our modern and expedient world.